WASHINGTON, -- A US Navy destroyer sailed within 12 nautical miles or within the territorial waters of an island claimed by China in the South China Sea, in a sign of increasing tension in the region days after Secretary of State John Kerry visited Beijing attempting to settle long standing territorial disputes. Taiwan and Vietnam also have claims to the island as well. 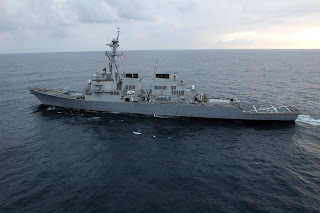 The guided missile destroyer USS Curtis Wilbur (DDG-54) conducted a freedom of navigation operation Saturday near Triton Island, part of the Paracel Island chain in the South China Sea, a Pentagon spokesman confirmed to Fox News. There were no Chinese warships in the area at the time and the transit was characterized as "innocent." "This operation was about challenging excessive maritime claims that restrict the rights and freedoms of the United States and others, not about territorial claims to land features," said Capt. Jeff Davis, a Pentagon spokesman. Davis said none of the three claimants to the island were notified before the US Navy warship transited the area as part of a "normal process" supported by international law. Davis refused to single out China specifically. Earlier this month, China landed a pair of civilian airliners to test a newly constructed airstrip atop Fiery Cross reef, which the Chinese have converted into an artificial island in the South China Sea. US defense officials believe military jets could be coming soon. Earlier this week in Beijing, Secretary Kerry refused to criticize his host publicly or accuse the Chinese of wrong doing in the South China Sea over the build-up of artificial islands worrying its neighbors in the region. Kerry said the United States "does not take sides on the sovereignty questions underlying the territorial disputes." "I pointed out to Secretary Kerry that the South China Sea Islands have historically been China's territory. China has a right to protect its own territorial sovereignty," said Chinese Foreign Minister Wang Yi. A spokesman for Secretary Kerry was asked about the recent exchange at a press briefing Friday. "We continue to be concerned about Chinese activities with respect to militarization on these reclaimed features," said State Department spokesman John Kirby. Secretary of Defense Ash Carter said in Asia last summer he was "deeply concerned" about China's build up on its man-made islands which risked "miscalculation or conflict." Carter has promised more military operations in the South China Sea. "Make no mistake: The United States will fly, sail and operate wherever international law allows, as we do around the world, and the South China Sea is not and will not be an exemption," said Carter in Boston in October standing alongside Secretary Kerry and their respective Australian counterparts. The guided-missile destroyer USS Curtis Wilbur (DDG 54) transit the western Pacific Ocean during a regularly scheduled underway period.